Mobile Devices in Business : The journey. I have been working with mobile devices in some format since 2007 when I presented with Paul Rodley at the mLearn International Conference here in Melbourne. What made this conference interesting was that we were the only ones presenting with Apple devices (basic iPods) but still…. In 2006, I was awarded the ‘Apple Distinguished Educator’ award for excellence in Music Technology and Mobile Learning (yes, I am a fully qualified classroom music teacher who also has her Cert IV in Adult Training and Assessment). I have been passionate about adult learning for a very long time and it was the basis for my thesis (professional development in the classrooms) at the University of Melbourne back in 2002. In and amongst this, have been keynoting and presenting at several state, national and international (such as uLearn in NZ) conferences focused on educational technology. I guess my passion to see these devices being used more productively stemmed out of sitting in a Qantas Lounge with a group of (ADE’s – Apple Distinguished Educators) sharing ideas with our mobile devices including iPads. Someone who was an executive from a major Australian corporation was very intrigued how we were using them (he barely used his, even then mostly it was for playing games). Since then, I have been writing for professional women’s communities, magazine articles globally and concentrating on Tech Coach HQ this year. Onto, my ideas for today. There are some great products out there that help the iPad really make an impact with your business whether it is as a second display for your computer (that has been of huge benefit to me), printing from the iPad, using it as an external keyboard, using it for purchases with add on equipment for restaurants and businesses that need to take credit card payments. 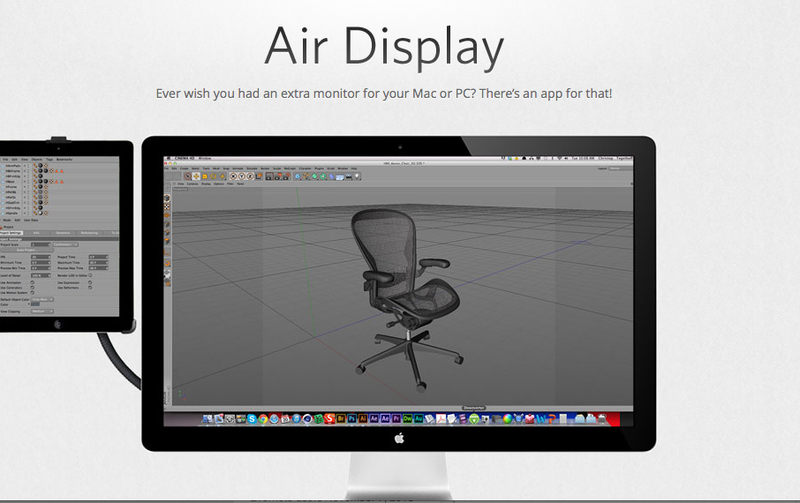 Air Display is one of the apps that can be used to turn your iPad/Android tablet into a second display (with Mac or Windows). This can be handy for graphic designers, musicians/composers (very handy when using Logic or GarageBand), it’s great for Real Estate agents when they are working on the laptop and the clients can see the options available to them (instead of peering over the real estate agents shoulders). Here is an article explaining more options for using your tablet as as a second display. Recently when working with one of my accountancy clients, I was asked to explore the options for using iPads in a ‘paperless’ environment. The staff still had desktop computers but used iPads for meetings and when they were out of the office. Newer printers have AirPrint technology and a list of these printers is available on the Apple Support Page. See below for steps to print. There are also third party apps (print servers) you can use to help bridge the gap if your printer doesn’t have Air Print capabilities . Go to this link for further information. One of the options you can use when printing from your Android device, is Google Cloud Print. Since I am not an Android user, I found a brillant article here on using printers with Android devices. I am constantly discovering new tips and tricks as well as ways of doing things smarter. Recently someone introduced me to Splashtop. This software enables you to access and control your computer via your mobile device. Splashtop Remote/Streamer is the app that you need to download via your desktop as well as the app for iPad. I followed this article from CNET to set it up on my iPad and Mac. Off to prepare for a client meeting, try out these new ideas and let Tech Coach HQ know how you go. Remember, even when there is information overload or ‘infowhelm’, take one ‘byte’ at a time. Click here to go to Day 7 of the Blog Challenge.